Local dignitaries joined forces with schoolchildren from across South Tyneside in a special ceremony to remember members of the Australian and New Zealand Army Corps (ANZAC). The Mayor of South Tyneside, Councillor Ernest Gibson, and Mayoress Patricia Ridley, laid a wreath at the John Simpson Kirkpatrick memorial statue on Ocean Road and led a one minute silence in memory of those who fought at Galipoli in the First World War. Children from Lord Blyton, Forest View and Laygate primary schools were also at the service which was led by Reverend Paul Kennedy. South Shields-born John 'Jack' Kirkpatrick used a donkey he had befriended to rescue hundreds of Australian and New Zealand soldiers. He was killed by a sniper's bullet in 1915 at the age of just 22. His acts of heroism inspired generations of people and he is still highly regarded in Australia where his amazing story is told to schoolchildren. 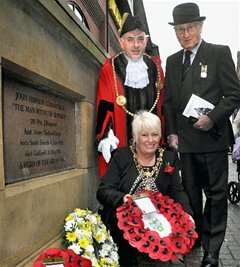 Councillor Gibson said: "John Kirkpatrick is a local hero and we are proud to hold this service in his memory. "It is particularly important in this centenary of the outbreak of the First World War, to remember and commemorate our local heroes and all members of the Armed Forces who have served, and continue to serve this country, in conflicts around the globe."